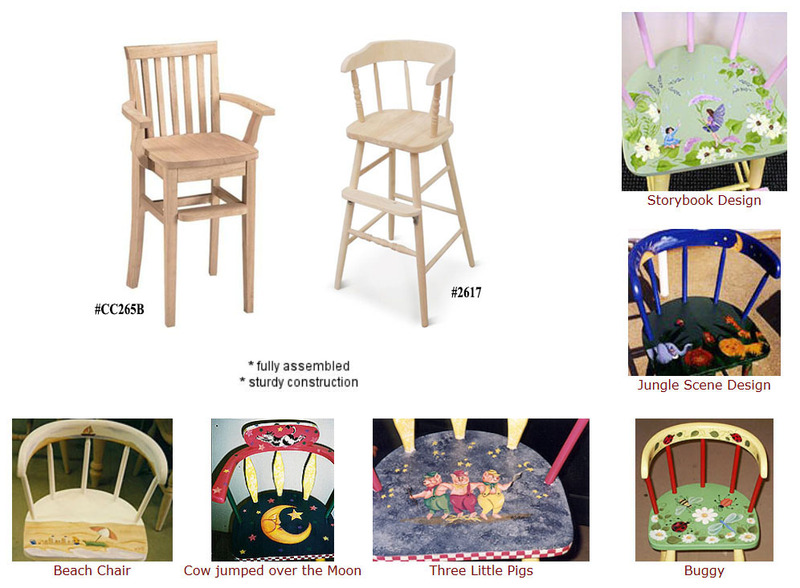 CC265B Youth Chair & 2617 Youth Chair - Designs shown have been applied to #2617 but can be applied to ANY item. The unfinished chairs above show the chairs styles that are currently available. They are available in one of the hand painted designs shown or call and design your own special handpainted chair. They are also available; Unfinished, in one of our, stains, paints even in a specialty distressed finish. Color changes and design changes are always available, ask for your child’s name added at no additional charge to the handpainted designs. Made of Hardwood Parawood, finished with a clear acrylic topcoat. Please Note: Hand painted pieces are all one-of-a-kind originals and will vary from piece to piece. All pricing is accurate at time of posting but may change without notice. Copyright © 1997- 2019 Furniture Gallery Inc.
Delaware Web Design by: Coastal Images Inc. for Beach-net!